As precipitation pours from the clouds above, temperature plays the most important role on whether we see rain, snow, or something in between. Once temps get cold enough and snow piles up on the ground, that snow plays a major role in weather — especially in the spring. Albedo is a word that describes how much sunlight a particular surface reflects. It ranges from zero to one and the higher the number, the more sunlight the object reflects. Something like blacktop, for example, would absorb most of the sunlight that hits it, making its albedo close to zero. Fresh snow, on the other hand, reflects most of the sunlight that hits it, making its albedo is close to one. That is a very simplified version of a much bigger story. Things like trees, clouds and water fall somewhere in the middle of the spectrum. In order to calculate the impacts of each of the absorption of sunlight, there are satellites in orbit that constantly measure the albedo of the earth. One of the biggest factors concerning the changing albedo is snowpack. Snow on the ground reflects sunlight that would otherwise be absorbed by the darker surface below. This can affect the temperature during the day. During spring, the higher sun angle plays a big role in temperatures. Snow-covered areas reflect that sunlight and keep the ground cooler. A darker surface, such as tar or grass, heats more as it absorbs the radiation of the sun. This heat stays down near the earth&apos;s surface, causing daytime temperatures to rise. Snow on the ground plays another role when it comes to springtime temperatures — it acts as an insulator. The snow on the ground behaves like ice in a cooler, keeping the ground nice and cool on otherwise warm spring days. Beyond keeping the surface cooler, the snow also insulates the ground below. A foot of snow on the ground can keep the soil from being impacted by drastic swings in temperature. Daytime melting and nighttime refreezing change the ground&apos;s ability to absorb water and even trap heat. This plays a role in springtime water retention and flooding. The combination of insulating snow and reflecting light typically help stretch the final hold of winter through March, but as snow melts on unseasonable warm days, temperatures begin to climb. This starts a positive feedback loop that can keep temperatures above normal during the transition between winter and spring. The difference between a snow-covered ground and a bare ground can change the temperature by almost 10 degrees Fahrenheit in the right conditions. The higher albedo of white snow and the insulation of the frozen water at the surface combine to drop daytime high temperatures. 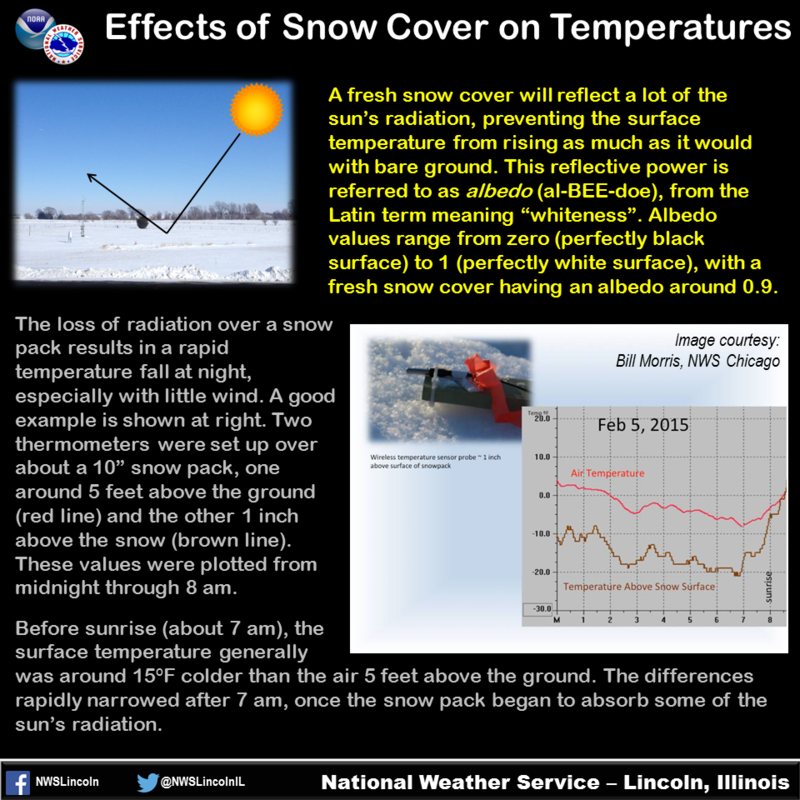 As snow melts, the albedo decreases and more radiation is absorbed by the surface, causing temperatures to rise. Rising temperatures melt more snow, melting snow raises temperatures, creating a cycle of melting and heating known as a positive feedback loop. Each one helps the other along, allowing temperatures to climb through spring. The extended forecast calls for sunshine and above-freezing temperatures. This means that more snow will melt in the coming days. As the snow melts, the bare ground will absorb more warmth. This will aid in temperatures staying above normal for the next month. So, this early onset to spring and above-normal temperatures here in Anchorage will likely continue through, at least, the time snow would normally be completely melted away.